I recently returned from an extended camping trip to the Southwest: 50 days, 7700 miles, 13 states, 10 National Parks/Monuments, 9 museums, etc. You get the idea and, no, we are never doing so much so fast again. But the most interesting statistic is this: 4 watersheds. A watershed is a clear concept but a little hard to define eloquently. Here is one definition by the EPA: A watershed is the area of land where all of the water that is under it or drains off of it goes into the same place. Much better is what the famous American scientist/explorer John Wesley Powell said about watersheds: that area of land, a bounded hydrologic system, within which all living things are inextricably linked by their common water course and where, as humans settled, simple logic demanded that they become part of a community. Hmmm, inextricably linked, eh? We will get back to that later. But watershed can also mean a divide or a turning point; for example,” It was a watershed moment in the history of the environmental movement”. Obviously I started in my home watershed, the Paw Paw-St. Joseph-Great Lakes-St. Lawrence route to the Atlantic Ocean. However, within the 1st hour of the trip, I was in the Mississippi-Gulf of Mexico watershed. In fact I spent most of the 1st week following the Wabash, then the Ohio, and finally the Mississippi rivers on their southward course. But you can’t follow these rivers without starting to think about two things: topsoil and floods. Especially in the spring, these rivers are a muddy chocolate brown carrying tons of topsoil from the Midwest and Great Plains down to the Gulf. Every time a farmer plows or tills a field anywhere from Montana to Minnesota to Ohio to Alabama, a small amount of topsoil ends up running off his field into a ditch-stream- river and ,ultimately, down the Mississippi into the Gulf. The flooding issue is also readily apparent: you drive alongside huge dikes thru the Mississippi delta for hundreds of miles. And these are the least obvious of the engineering attempts by the Army Corp of Engineers. Huge dams on the Tennessee and Cumberland Rivers have turned those formerly fast, free flowing rivers into reservoirs. You will note that I refuse to use the term “lake” to describe a body of stagnant water behind a dam [and my apologies to all TRC members residing on Maple Lake in Paw Paw]. And then there is the ultimate in engineering hubris: the destruction of the mangrove swamps and bayous along the Gulf Coast in the name of development and progress. But we know from Hurricane Katrina that no manmade system of levees, canals, dikes or floodgates can manage the tidal surges of a major hurricane as well as the natural system of barrier island, mangrove swamp, and bayou. Definitely a watershed with problems; big ones. Luckily, I was soon distracted by another major watershed: the Rio Grande River. 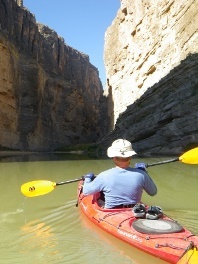 This was the highlight of my trip, a 4 day solo kayak trip down the Rio Grande in Big Bend National Park. I had a blast paddling down this designated Wild and Scenic River and it was a true wilderness experience. But the water level in the river was agonizingly low. Enough for me in my kayak but fully loaded canoes constantly scrape bottom. And white water rafting? Forget it. 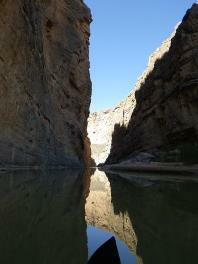 Normally the canyons along the Rio Grande thru Big Bend are a major destination for adrenaline junkie rafters. But not lately; there simply is not enough water to create the rapids and strong current necessary for rafting. 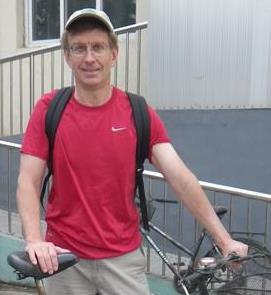 In fact, the adventure outfitters in Big Bend are having to scramble to adapt to this brave, new and very dry world and some are now primarily offering mountain biking. I was looking at a river bed. And the story it told of a river that flowed made me sad to think it was dead.